People born in the third quarter are dual. They can do more than they want. Usually at the first stage of their life they are quite successful, and, like the people of the second quarter, they are able to live in the surrounding world. Well feel it. Gradually, they are less and less external success. Some of them are on the way to social success, and some, after reaching it, depart from their goals and move on to others. This usually occurs at a later age - either after the completion of the second cycle of Saturn, or after forty years. As they age, they become more and more self-absorbed, turn to their inner world and end their lives in the circle of close people, having lost interest in any social activity. Often they go into philosophy, religion. 1. If the moon hangs in the sky with its horns and upwards its back (the last quarter), then it will be cloudy and rainy for a long time. 2. What is the weather for the damage to the moon, this will be the same throughout the whole quarter. The fourth quarter of the waning moon completes the lunar cycle. 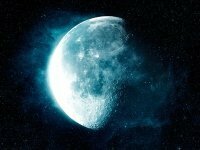 At this time, the Moon seems to take with it all the negative energy that has accumulated over the month. It is time to finish the begun or the final and irrevocably get rid of spells, evil eye, spoilage, various diseases. Magic can be aimed at the disappearance of bad habits, bad attitudes and everything unnecessary. You can also do energy cleaning of the premises and the body. But remember that the last two days of the lunar cycle in magic are called "black moon". So do not forget about protection from the dark forces.